The lost has been found! Boss Abele finally got done hiding from the public and made a rare appearance at the Milwaukee County Courthouse. The occasion was that he was finally presenting his 2015 county budget. It took about two minutes to make one realize he did not spend that week making sure that the budget was up to snuff. It took about three minutes to make on wish that Abele and his budget was still missing. As hard as it is to believe, Abele actually makes Scott Walker look competent and a good leader. Oh, if you listen to Boss Abele, and can make out what words he's trying to bleat out, you'd think that this budget was the greatest thing since slice bread. He claims to do everything short of curing cancer with this budget, giving big increases to the Sheriff's Office, to the mental health care system, the parks and everyone else (except for the workers, of course!). The reality is that Abele's budget is as sketchy as a police artist's drawing. While I'll be discussing the budget in detail in later articles, let's look at some of the "highlights" of Abele's smoke and mirror budget. Abele brags about putting nearly $4 million into the Sheriff's Office. Only he's not really doing that. And again, Abele seems to forget that he is again trying to spin off the jobs of deputy sheriff's to the already overburdened municipal police. Abele is proud of putting more than $4 million towards the War Memorial Center and Milwaukee Art Museum, but forgets that he is contractually obligated to do that. He also forgot to mention that he threatened not to pay it. Abele is also on a privatization kick that makes Walker look like a slacker. Abele has privatized or wants to privatize the mental health system, the WATTS Review Unit (they do court reports on whether people with mental health issues need to be hospitalized), security officers, IMSD (tech support), the food service at the zoo and various airport services. Abele also wants to sell off county parks and other assets to his fellow plutocrats for a fraction of their worth. For example, he wants to sell O'Donnell Park for $14 million. When all the costs and debt service is paid off, the county will be lucky to net $5 million. The parking structure alone is worth well over $32 million. But while he has found money to sell off assets for a song, buy new voting machines for all the municipalities, hand out lucrative contracts to his fellow wealthy elite, he just can't seem to find any money for the workers. Not only are the workers not getting a raise for the seventh straight year, they are taking yet another pay cut. This time, the hit will be for $2,000, on top of the thousands he is already bilking workers for. This will mean that many workers could be paying as much as a third of their pay for benefits they were already paying for by taking a salary much lower than the private sector. Again, that is his plantation economy mindset in action. The funny thing is that he is saying he can't afford to leave the worker's pay alone, much less give them a raise, because of a supposed deficit of $32 million. This is from the same guy who was bragging about a $24 million surplus a few months ago, $5 million of which came straight off the backs of the workers he supposedly cares so much about. The county is already seeing an unprecedented level of turnover in staff. If Abele gets his way, it will only get worse. That in turn will mean more money being used for training and less services for people who depend on services from the county. It should prove to be rather interesting to see how the county board responds to this maleficent budget. They no longer have much to worry about politcally speaking, since Abele already bought and paid for Act 14, which severely damaged the ability of the board to do its job while consolidating power in Abele's hands. Also, Abele doesn't have much political clout anymore, as evidence by his going 0 for 4 in the August primaries. 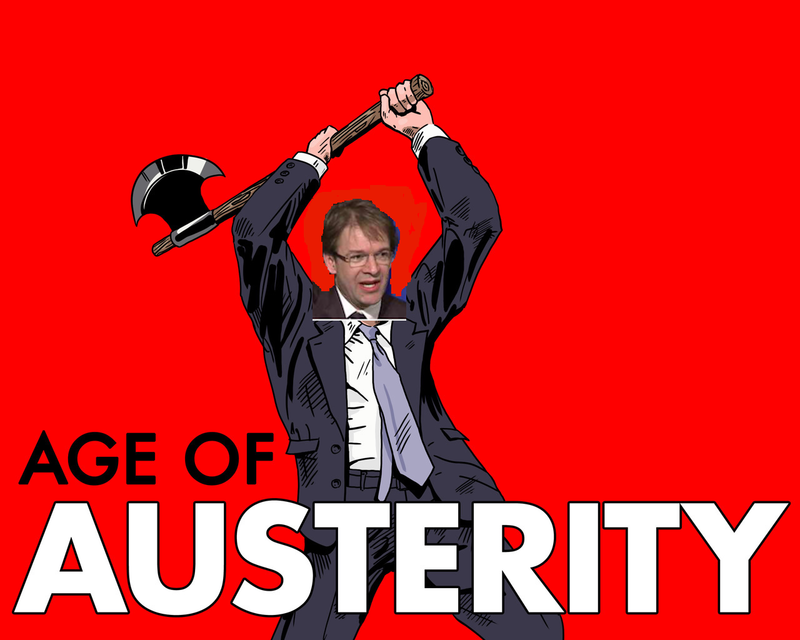 Abele's recommended 2015 budget can be found here. The county board's budget hearing schedule can be found here. "New voting machines for all the municipalies" ????? What kind????? I'd really like to know.